Since 2000, We have worked together with the King Range National Conservation Area, managed by the Bureau of Land Management, to bring educational and interpretive programs about nature to local schools and adults. The King Range National Conservation Area covers 68,000 wild and rugged acres and extends along 35 miles of coastline in a spectacular meeting of land and sea. Over 100 miles of trails and few winding roads keep human impact light. The King Range is part of our country’s National Conservtion Lands, officially known as the National Landscape Conservation System. In 1970, Congress designated the King Range on the northern California coast as the nation’s first National Conservation Area and gave the Bureau of Land Management (BLM) responsibility for its management. National Conservation Lands comprise 28 million acres which include National Monuments, Conservation Areas, Wilderness and Wilderness Study Areas, Wild and Scenic Rivers and Historic Trails. The BLM’s mission for the National Conservation Lands is to conserve, protect, and restore nationally significant landscapes and places that have outstanding cultural, ecological, and scientific values for the benefit of current and future generations. Their vision is to be a world leader in conservation by protecting landscapes, applying evolving knowledge, and bringing people together to share stewardship of the land. The BLM’s multiple-use mission, set forth in the Federal Land Policy and Management Act of 1976, mandates that we manage public land resources for a variety of uses, such as energy development, livestock grazing, recreation, and timber harvesting, while protecting a wide array of natural, cultural, and historical resources, many of which are found in the BLM’s 27 million-acre National Landscape Conservation System. The conservation system includes 221 Wilderness Areas totaling 8.7 million acres, as well as 16 National Monuments comprising 4.8 million acres. The BLM does its complex and challenging work with an annual budget of more than $1 billion and a workforce of about 10,000 full-time employees. The BLM is one of a handful of Federal agencies that generates more revenue for the United States than it spends. For example, in Fiscal Year 2012, nearly $5 billion will be generated by activities on BLM-managed lands, including an estimated $4.3 billion from onshore oil and gas development, with about half of those revenues going to the states where the mineral leasing occurred. 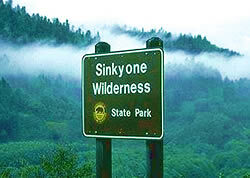 The Sinkyone Wilderness State Park is located along the southern boundary of the King Range National Conservation Area, this 7,500 acre park is primitive and managed as wilderness. The Mattole Restoration Council is one of North America’s oldest community-led watershed restoration organizations. Established in 1983, the Council’s primary mission is to understand, restore and conserve the ecosystems of the Mattole River watershed, with attention to threatened coho and Chinook salmon and steelhead. The Council works to further the objectives and purpose of the Mattole Restoration Council, “the restoration of natural systems in the Mattole River watershed and their maintenance at sustainable levels of health and productivity”. The National Conservation Lands are our nation’s newest collection of protected lands and waterways—standing proudly alongside our National Parks, National Forests and National Wildlife Refuges as treasured places belonging to every American. Learn more about the National Conservation Lands and what we do to protect, restore and expand them. The King Range Alliance maximizes collaboration among King Range National Conservation Area groups to advance public conservation and educational activities. We inspire involvement of students, visitors and the community to steward, preserve and restore the natural life of the King Range Natural Conservation Area. We are a collaborative partnership between the Mattole Restoration Council, Lost Coast Interpretive Association, Mattole Salmon Group and Sanctuary Forest. The mission of Mountain to the Sea Wilderness Camp is to give girls and women the opportunity to develop a deeper connection to themselves & the wilderness around them using The Lost Coast as our classroom – through wilderness survival skills, animal tracking, plant identification and more.